running about four weeks plus ship time from them to Our Location. 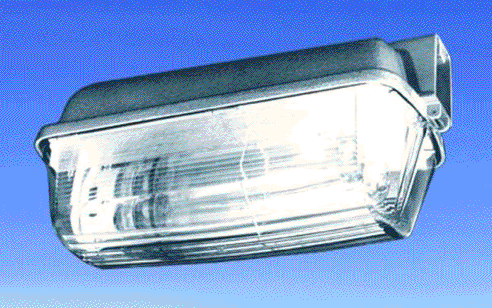 These include the 101, 103, P203, 105, 107 and P207 lights. 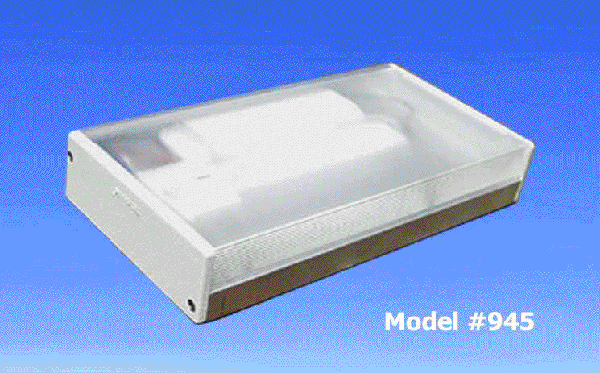 replacement ballasts and lenses for them. The 111 fixtures have been discontinued. dual 8 watt tubes, available with either the standard model with the fake wood strip on lens or in a No Trim model without the strip. 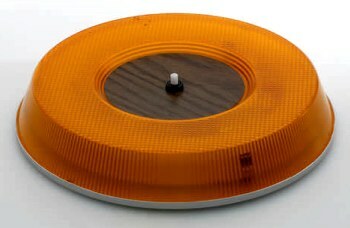 Dual 14 watt Panel light for post 1980 Airstream vents. 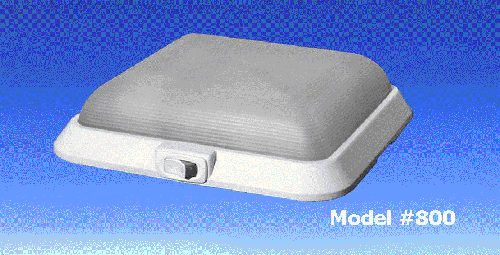 This model of fixture is used in some Airstream travel trailers. It fits around the vent / fan in the ceiling. Dimensions: app. 15" long by 10-3/4" wide by 1-1/2" front to back. owners to identify their light. 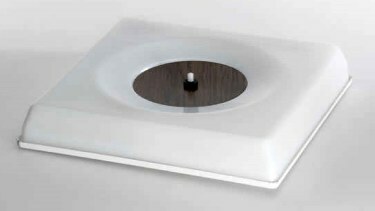 We can special order this fixture, the build time is running about four weeks. 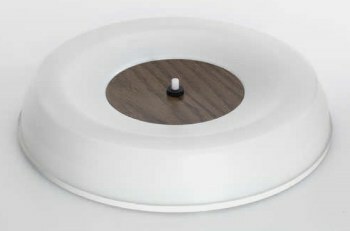 Please note: the shipping will be pricey and we will have to make a special box to fit this light fixture. The 125 fixtures have been discontinued. 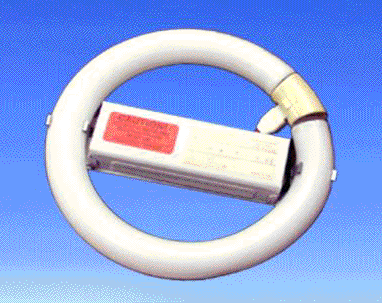 single 32 watt cool white tube with RFI suppressed ballast and no lens. Basically a shell which fits into a cutout in the ceiling. The vehicle manufacturer supplies a drop down lens. Fixture dimensions: 48" by 5.375" by 1.75"
dual 15 watt tubes, white housing, 18" by 5.375" by 1.75"
tubes and two 197 ballasts) - fits into a cutout in the ceiling. Dual 17 watt tubes, GOLD finish, 24" by 5.4" by 1.75"
dual 32 watt tube) series of fixtures are no longer available. 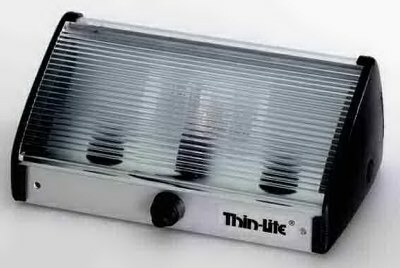 uses a single 17 watt tube - Not Included - no lens, 24.125" by 3.375" by 1.63"
uses a single 32 watt tube - Not Included - no lens, 48.125" by 3.375" by 1.63"
single 8 watt tube with amber lens, 12.8" by 3.8" by 2.75"
single 15 watt tube, clear or amber lens, 18.5" by 3/8" by 2,75"
28 volt NO SWITCH, the switch hole has a plastic plug and there is a hole in the top of the housing for the power wires - net weight: 2 lb., 2 oz. single 30 watt tube with clear lens, 36.5" by 3.8" by 2.75"
Description All have black end caps as standard. 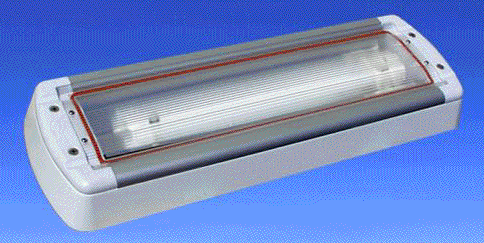 single 8 watt tube with clear lens, 17.68" by 2.25" by 1.25"
single 13 watt tube with clear lens 26.68" by 2.25" by 1.25"
dual 13 watt tubes, clear lens, NO SWITCH, 47.75" by 2.25" by 1.25"
dual 6 watt tubes, frosted lens, 26" by 2.25" by 1.25"
single 6 watt tubes, clear lens, 15.37" by 2.25" by 1.25"
single 17 watt tube, clear lens, no trim, 24.125" by 3.375" by 1.63"
uses a single 32 watt tube, clear lens & no switch - Tube is not included on this model - uses an F32T8 tube. 48.125" by 3.375" by 1.63"
uses a single 24 watt Bi-Ax lamp, 14.25" by 3.63" by 3.5"
uses a single 36 watt full spectrum Biax lamp, 18.25" by3.625" by 3.5"
uses two 15 watt (f15T8) tubes, one with red sleeve, fixture has two switches and two OIB-115 ballasts, one for each tube. You can choose either a white or red light. 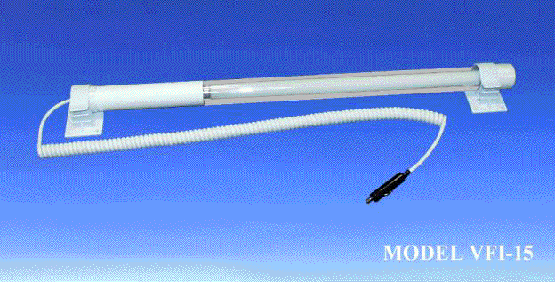 single 8 watt tube, clear lens, 12.5" by 2.6" by 2.5"
single 15 watt tube, clear lens, 18.25" by 2.6" by 2.5"
dual 15 watt tubes, white translucent lens 18.25" by 5.625" by 1.625"
single 30 watt (F30T8) tube in a shell for recessed ceiling installation where the vehicle manufacturer supplies a drop down lens, 36.25" by 5.375" by 1.75"
Warm White tubes are no longer available. 553 showing discontinued mounting collar. 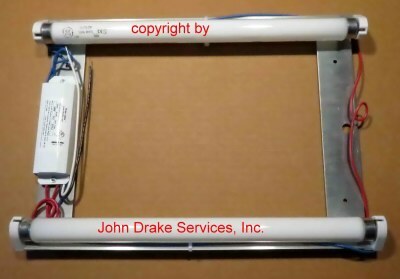 24 watt BIAX tube for recessed installation only - 18.82" by 5.92" by 1.99"
39 watt Biax tube for recessed installation only - 22.63" by 5.92" by 1.99"
dual 37 watt biax tubes, 52.625" by 5.3" by 1.75"
dual 15 watt (F15T8) tubes, rounded ends and sides, 19.67" by 5.56" by 1.51"
dual 8 watt (F8T5) tubes, Euro style, 16.843" by 7.3" by 1.56"
dual 15 watt (F15T8) tubes, Euro style, 22.652" by 7.3" by 1.56"
dual 15 watt (F15T8) tubes Elegant fixture with sloped ends, dual switches and dual IB-115 ballasts, one tube has a red sleeve, 20.625" by 5.53" by 1.57"
recessed fixture using two 8 watt (F8T5) tubes with a clear prismatic lens, fixture dimensions: 14.75" by 2.0" by 6.625", recommended opening size: 14.25" by 5.313" by 1.25"
- with switch, 39" by 6.625" by 2"
recessed fixture with gray frame, uses a single 15 watt (F15T8) tube. Overall dimensions: 20.125" by 4.3125" by 1.875", suggested mounting opening: 18.25" by 3.375" by 1.5"
off white / olive caps. The original end cap color is no longer available. 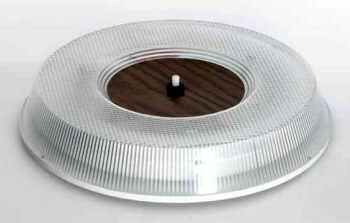 recessed fixture with two 15 watt (F15T8) tubes, 20.531" by 1.75" by 6.625, recommended mounting opening size: 19.25" by 5.25" by 1.00". 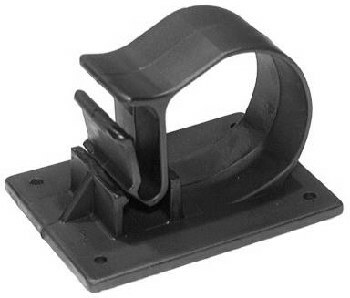 Has white end caps, this particular model has a center mounting hole. 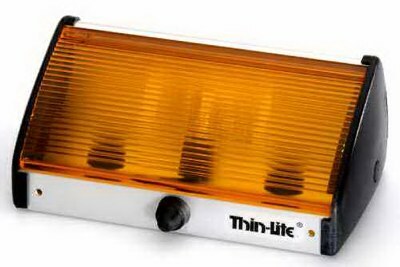 Please note, the availability of these 900 series of lights is based on components inventory at Thin-Lite. 7 watt full color spectrum compact fluorescent lamp with RFI suppressed ballast - 6.875" by 4.5" by 1.5"
9 watt full color spectrum compact fluorescent lamp with RFI suppressed ballast - 8.875" by 4.5" by 1.5"
11 watt full color spectrum compact fluorescent lamp with RFI suppressed ballast - 12.875" by 4.5" by 1.5"
13 watt full color spectrum compact fluorescent lamp with RFI suppressed ballast - 8.875" by 4.5" by 1.5"
18 watt full color spectrum compact fluorescent lamp with RFI suppressed ballast - 12.875" by 4.5" by 1.5"
24/27 watt full color spectrum compact fluorescent lamp with RFI suppressed ballast - 14.875" by 4.5" by 1.5"
36/39 watt full color spectrum compact fluorescent lamp with RFI suppressed ballast - 18.875" by 4.5" by 1.5"
40 watt full color spectrum compact fluorescent lamp with RFI suppressed ballast - 24.875" by 4.5" by 1.5"
single 17 watt tube with clear lens, 30.63 by 2.6" by 2.5"
This series of light have been discontinued. Replacement parts and components are no longer available. 15 watt tube (F15T8), white end caps & clear tube housing, with power cord and mounting brackets included, NO SWITCH 26.0" by 1.5"
15 watt tube (F15T8), has pigtail power wires, black caps and clear tube housing, NO SWITCH 26.0" by 1.5"
30 watt (F30T8) tube in a clear housing with black end caps, has pigtail power wires, 44.5" by 1.5"
24 volt - 30 watt (F30T8) tube in a clear housing with black end caps, has pigtail power wires, 44.5" by 1.5"
32 watt (F32T8) tube in a clear housing with black end caps, has pigtail power wires, 56.25" by 1.5"
Pair of mounting brackets for the VFI Series of lights.